These rice cakes play an important role during the New Year celebrations in Japan. There are a few kigo with them.
. yoroi　鎧 armour, armor of a samurai . Gusoku biraki 具足開 "opening the armour"
This was celebrated in the samurai homes on the 12th day of the first lunar month. 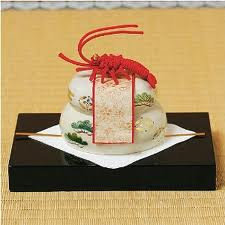 Since it later became identical with the death anniversary of the third shogun Tokugawa Iemitsu, it was relocated to January 11.
. WASHOKU - Food Decorations . Kagami mochi (鏡餅, Kagami mochi), literally mirror rice cake, is a traditional Japanese New Year decoration. It usually consists of two round mochi (rice cakes), the smaller placed atop the larger, and a mikan (a Japanese bitter orange) with an attached leaf on top. Further to this, it may have a sheet of konbu and a skewer of dried persimmons under the mochi. It sits on a stand called a sanpō (三宝 sanpoo over a sheet called a shihōbeni (四方紅, shihoobeni), which is supposed to ward off fires from the house for the following years. Sheets of folded paper called gohei (御幣) folded into lightning shapes similar to those seen on sumo wrestler's belts are also attached. The kagami mochi first appeared in the Muromachi period (14th-16th century). The name kagami ("mirror") is said to have originated from its resemblance to an old-fashioned kind of round bronze mirror, which also had a religious significance. The reason for it is not clear. Explanations include mochi being a food for sunny days,the 'spirit' of the rice plant being found in the mochi, and the mochi being a food which gives strength (chikara mochi　力餅). The two mochi discs are variously said to symbolize the going and coming years, the human heart, "yin" and "yang", or the moon and the sun. The "daidai 橙、代々", whose name means "generations", is said to symbolize the continuation of a family from generation to generation. Traditionally the kagami mochi was placed in various locations throughout the house. 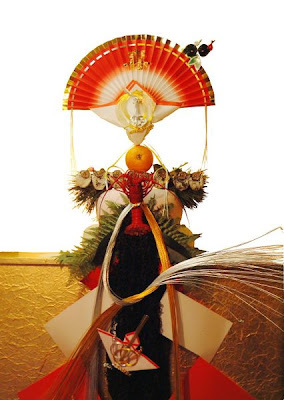 Nowadays it is usually placed in a household Shinto altar, kamidana　神棚. It has also been placed in the tokonoma　床の間, a small decorated alcove in the main room of the home. Contemporary kagami mochi are often pre-moulded into the shape of stacked discs and sold in plastic packages in the supermarket. A mikan or a plastic imitation daidai are often substituted for the original daidai. Fern (shida　歯朶)is also used for the decoration. Variations in the shape of kagami mochi are also seen.In some regions, three layered kagami mochi are also used. The three layered kagami mochi are placed on the Buddhist house altar, butsudan 仏壇or on the kamidana. 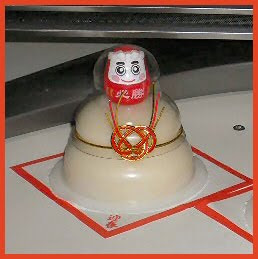 There is also a variant decoration called an okudokazari placed in the centre of the kitchen or by the window which has three layers of mochi. It is traditionally broken and eaten in a Shinto ritual called kagamibiraki, kagami biraki (mirror opening 鏡開) on the second Saturday or Sunday of January. This is an important ritual in Japanese martial arts dojos. 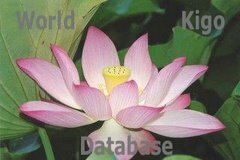 It was first adopted into Japanese martial arts when Jigoro Kano, the founder of judo, adopted it in 1884, and since then the practice has spread to aikido, karate and jujutsu studios. When the mochi are cut in small pieces at kagami biraki, they are very hard and put into vegetable soup (zooni) or sween bean past broth (o shiruko お汁粉) for better digesting them. Mochi themselves are neutral in taste and can be adjusted to any kind of tasty preparation.
. kamidana 神棚　"shelf for the Shinto Gods" . ..... even the poor cooked pure boiled rice and pounded rice cake from pure glutinous rice for important meals. Pounded rice cakes (mochi), prepared by pounding steamed glutinous rice with a mortar and pestle, have been indispensable food items for Japanese ceremonial feasts. People thought that the essence — the sacred power of rice — was made purer by pounding, and mochi was believed to contain the "spirit of rice." Naturally this was and is the most celebrated form of rice and therefore the most appropriate food for feasts. Thus, New Year’s day, the principal annual feast in Japan, sees mochi always consumed as a ceremonial food. Food of Japan, by Naomichi Ishige !!!!! Driving an ox with ferned rice cake. The year of the Ox! In this haiku, as Shinji Ogawa explains, someone "borrows" Buddha's lap to place the cakes upon...　for a while. I suppose that Issa left the cakes as offerings to the Buddha for about as long as he could stand it (just "a little while"), then ate them. ***** Pounding rice (mochi tsuki, mochitsuki) More details on this subject.